Every woman has a classic black jacket in her wardrobe. It’s as versatile of a piece as it gets and can definitely be part of any capsule wardrobe. The idea of a mini “capsule” wardrobe is very dear to me. It’s a wardrobe made up of adaptable garments that you love and that make you look put-together when mixed and matched. It’s really applicable to any style, yet the result is always great . You typically need to update your capsule every season but the core pieces always work and save you time getting dressed. Black jacket is one of those all-season core pieces. 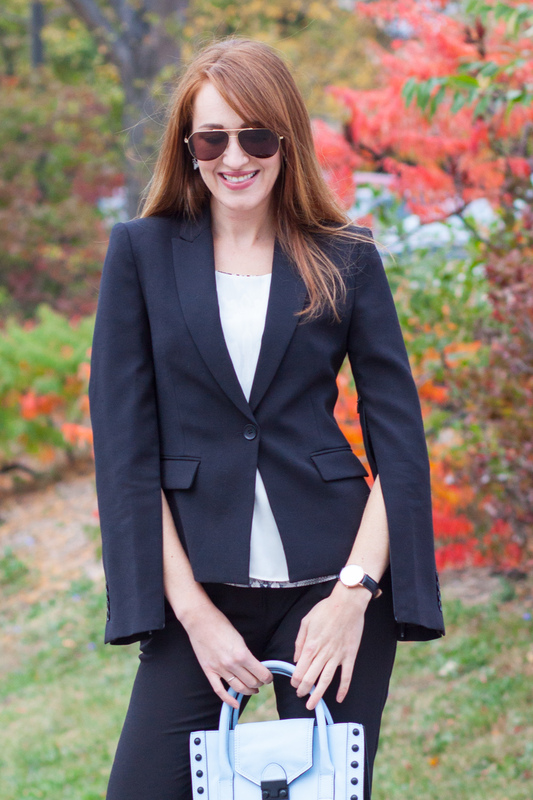 What I adore about the BCBGMAXAZRIA classic jacket I’m wearing here is the split sleeves option with zip closure. Not only this jacket is versatile but it can really smarten any outfit. you can never wear a black jacket too many times! you look fabulous! You are right every woman needs a black jacket. The split sleeves are unusual, never seen it before, but I think it is great!